Performance tracking, Spotify integration, better volume management tools, and cross-platform chat are available to Windows Insiders starting today. 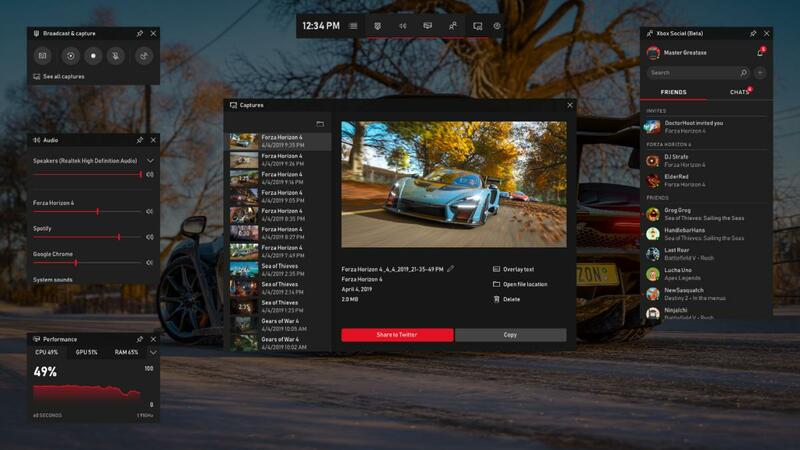 Starting today, Windows Xbox Insiders will have access to a new and expanded Game Bar. And the foundation of this new Game Bar? A fully customizable interface. As I said, it’s more an overlay than a bar at this point, a translucent window where you can add various widgets—or pin them, so they’re still visible while you play. Perhaps most interesting to the power users: A performance widget. Oddly enough, this one’s not highlighted in Microsoft’s blog post which may mean it’s not ready yet. It’s prominently featured in one of the screenshots they sent over though so...yeah. Anyway, you’ll be able to track your CPU, GPU, and RAM usage through the new overlay, negating the need to run a third-party program to do the same. I’d love to see temperature tracking in a future update as well, but nothing on that yet. There’s also a new “Audio” widget, with which you’ll be able to not only adjust your overall system volume but also the volume of every individual program running on your PC. I’m constantly multitasking, playing games while watching Netflix or listening to Spotify or whatever, and adjusting individual program volumes at the moment means hitting the Windows key, right-clicking the volume icon, and opening the Volume Mixer, and then adjusting sliders in an interface that hasn’t changed since Windows XP. The new Game Bar version looks sleek, and I’m excited to be able to dip Netflix’s volume on command. Speaking of, full Spotify integration is being added to the Game Bar as well. That widget will require a third-party login, according to the blog post, but afterward you’ll be able to control your music without Alt-Tabbing away from your game—particularly helpful in games where Alt-Tab support is questionable. Microsoft’s biggest play is chat-related though. They kind of bury that section at the bottom of the blog post, and when we spoke with the Game Bar team recently they didn’t make too big a deal out of it either. Or rather, it has the potential to be a big deal. See, Microsoft’s finally integrating more of its Xbox Live social functions into Windows 10. At the moment, your Xbox Live friends are siloed off in the Xbox app, which chances are you never open unless Microsoft forces you to. The new Game Bar has an “Xbox Social” widget though that shows you all your Xbox Live friends and what games they’re playing. If you haven’t opened the Xbox app recently, you’re probably unaware that it works whether you’re playing a Microsoft game or not—indeed, the screenshot shows people playing Apex Legends and Battlefield V, both EA games. It looks a lot like, well, Discord. And sure enough, Microsoft also touts that chat now works within the Game Bar as well. “The same friends list and communication features work on Xbox One as well as within the Xbox App on iOS, Android, and of course Windows 10,” says today’s blog post. It’s not just text chat, either. Voice chat works as well, meaning you could (if I’m understanding correctly) be playing one game on PC and your friend playing a different game on their Xbox, but voice chatting cross-platform through the Game Bar. That’s pretty amazing to me, as someone who lived through the “Every console is a walled garden and we must protect it from intruders” era. With Microsoft getting behind cross-play, cross-chat, all these platform-agnostic initiatives, it really feels like the walls are finally crumbling, to the benefit of all. 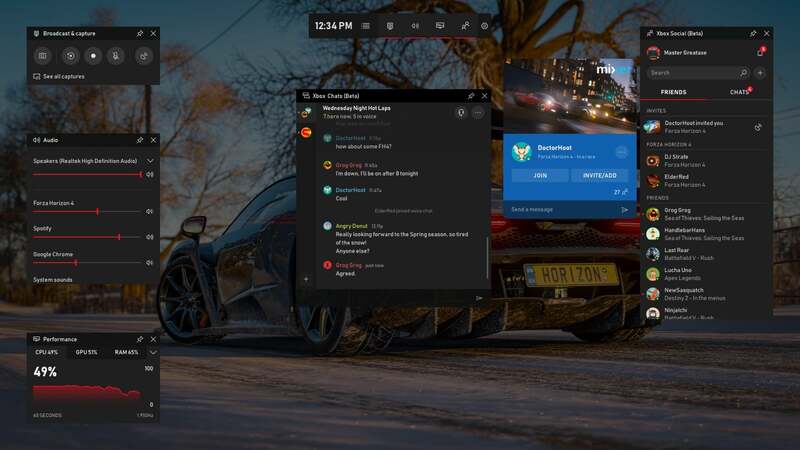 I’m not sure the ever-suspicious PC gaming crowd will trust Microsoft to facilitate chat over better-established and better-trusted PC clients, but it’s still exciting to watch unfold. As I said, these features are available to Xbox Insiders to test starting today, and after seeing these screenshots I’m actually pretty excited to give it a try. Until now, Game Bar’s just duplicated tools I already had available through other means. Better volume management tools, though? And a pinnable performance tracker? They’re not flashy features, but they’re exactly the kind of hooks Microsoft should be providing at the system level. Add in Spotify integration and the rest, and it’s at least a good reason for me to hit Win-G and give it a shot.